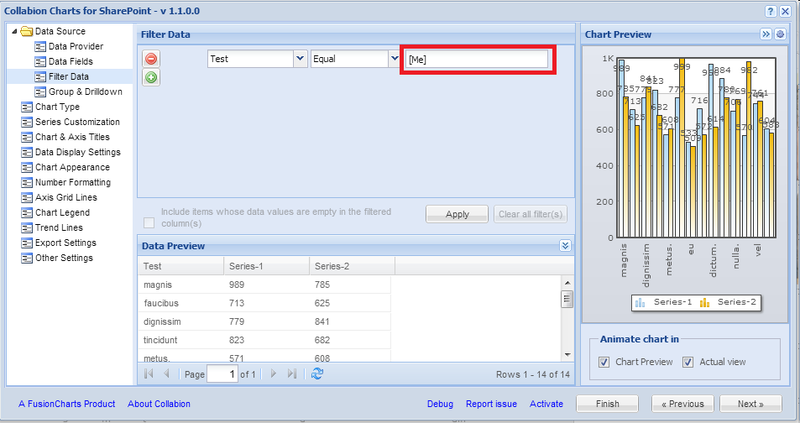 If I select a view that has a filter of PersonColumn = [Me] , the Collabion chart does not populate data. I assume this is because the chart queries the list via a service account instead of impersonating the current user. I would like to provide relevant charts to my users and without that functionality, I am unable to justify purchasing the product. Otherwise, the product is fantastic! Please send me an email if/when this functionality is ready. Good work on the product! Thanks for using our product. We have taken a note of your request and would - in all probability - fix it in our next product update. Could you please re-download the package from the web site (http://www.collabion.com) and check? Hi, I am interested in the current user filter integration with these charts. I am evaluating your product and am unable to filter a chart by using the current user filter. The built in SharePoint current user filter does not give me an option to send a filter to your charts. Am I doing something wrong or does your product not support this? Ideally I would want to send either the current user or a value associated with the current user such as department and filter the Collabion chart by current user department. Can you please assist? To use current user filter, you would have to use [Me] in filter value in "Filter Data" step. Please refer to the attached image.